FRANCEPOOL-BALNEO offers a series of accessories for the shower, tested by us with a good quality / price ratio. 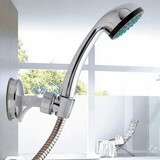 7-function shower head with STOP function. The 7 jets of water offer a wide choice of massages. 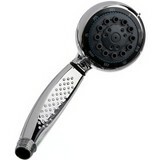 Shower head with universal end in chrome ABS. Multifunctional shower control panel from TES - TES HYDRO - Technology and seduction. Suction shower bracket, no drilling or gluing for fixing. Can support up to 5 kg. Can be repositioned according to your needs, at the desired height and in different positions with a simple gesture. Fixing without screws or drill! Repositionable at will, the metal soap dish is fixed to the wall without damaging it. The suction cup is perfectly locked by turning the knob a quarter turn. Natural and economical accessory, the pumice stone is an essential exfoliant for the beauty of the feet!